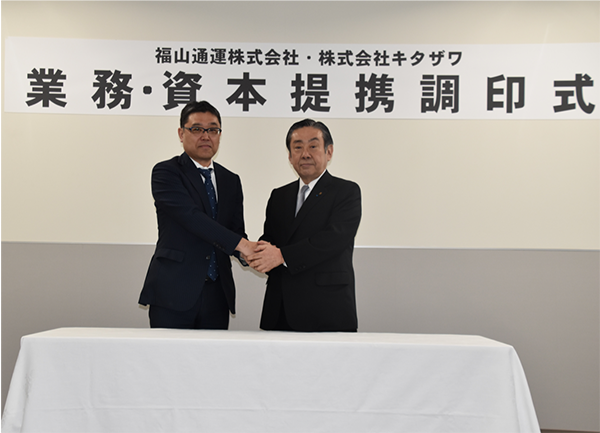 Fukuyama Transporting acquires 51% of Kitazawa's shares, and the capital alliance agreement was signed with both presidents present at the event. Tokyo, Japan - April 11th, 2018 Fukuyama Transporting Co., Ltd. (Headquarter: Fukuyama City, Hiroshima Prefecture; President: Shigehiro Komaru; shortened as Fukuyama Transporting) and Kitazawa Co., Ltd. (Headquarter: Koto-Ku, Tokyo; President: Toshiya Kitazawa; shortened as Kitazawa) signed a capital alliance agreement creating a business partnership for moving services. Furthermore, Fukuyama Transporting acquires 51% of Kitazawa's shares, and the capital alliance agreement was signed with both presidents present at the event. Although the main venture of Fukuyama Transporting is freight forwarding, the expansion of their moving business has always been an objective of the company. Since the establishment in April 1957, Kitazawa was also in the freight forwarding business. In April 1998, Kitazawa Moving Center Co., Ltd. was established, which as since continuously expanded in the Greater Tokyo Area. Given this business partnership, Fukuyama Transporting aims to increase profit and fortify the business model by absorbing the Kitazawa's intelligence of the ever growing moving business. As a company primarily based in Tokyo, Kitazawa is planning a business expansion utilizing the nationwide network of Fukuyama Transporting. Moreover, both parties are expecting a reduction in cost through joint-ownership of vehicles, and group purchasing for moving materials. Furthermore, the acquisition of 51% of Kitazawa's shares by Fukuyama Transporting will reinforce the tightly knit bond between the two companies. About Fukuyama Transporting Co., Ltd.
Business detail: Freight trucking operation, etc. Business detail: Freight trucking operation, Moving Business, etc. Sales: 1.188 Billion JPY (2017 Quarter) *Includes Kitazawa Moving Center Co., Ltd.
(Right) Shigehiro Komaru, President and C.E.O. of Fukuyama Transporting Co., Ltd.
(Left) Toshiya Kitazawa, President and C.E.O. of Kitazawa Co., Ltd.
Fukuyama Transporting is a publicly listed multi-module logistics company founded in 1948 and based in Fukuyama, Japan with a fleet of about 16,000 trucks, 20,000 employees, a rail line and 400 branches nationwide and throughout Asia.